Is it snowing in La Tzoumaz ?Thank you! The snow forecast for La Tzoumaz is: Light rain (total 3.0mm), mostly falling on Tue morning. Mild temperatures (max 6°C on Mon afternoon, min 1°C on Mon night). Wind will be generally light. La Tzoumaz Weather (Next 3 days): The snow forecast for La Tzoumaz is: Light rain (total 3.0mm), mostly falling on Tue morning. Mild temperatures (max 6°C on Mon afternoon, min 1°C on Mon night). Wind will be generally light. La Tzoumaz Weather (Days 4-6): Light rain (total 6.0mm) on Wed night. Becoming colder with heavy fall of snow, heaviest during Thu night. Freeze-thaw conditions (max 5°C on Wed afternoon, min -7°C on Fri night). Winds decreasing (fresh winds from the SSE on Wed night, light winds from the SSW by Thu night). Light rain (total 6.0mm) on Wed night. Becoming colder with heavy fall of snow, heaviest during Thu night. Freeze-thaw conditions (max 5°C on Wed afternoon, min -7°C on Fri night). Winds decreasing (fresh winds from the SSE on Wed night, light winds from the SSW by Thu night). Light rain (total 3.0mm), mostly falling on Tue morning. Mild temperatures (max 6°C on Mon afternoon, min 1°C on Mon night). Wind will be generally light. The above table gives the weather forecast for La Tzoumaz at the specific elevation of 2354 m. Our sophisticated weather models allow us to provide snow forecasts for the top, middle and bottom ski stations of La Tzoumaz. To access the weather forecasts for the other elevations, use the tab navigation above the table. For a wider view of the weather, check out the Weather Map of Switzerland. Just back from two weeks spent over Christmas and New Year and can honestly say that I managed to do some of the best skiing in my life. We are a family of seasoned skiers, having done most Europe famous resorts in France, Switzerland and Austria over the years so have something to compare with. So, why do we love La Tzoumaz? Amazingly easy access to Verbier ski area (fast modern 6-seater chair lift to Savolyers), no queues (in stark contrast to Verbier or Nendaz on either side), superb tree lined runs, amazing off-piste, better ski cover vs. southern facing Verbier, friendly locals, picture perfect views to opposite Iserables (much better than car congested Verbier). Easy drive from Geneva - just 1.5 hours or 2 hour train ride from Geneva airport to Riddes and just 15 mins drive up to the village. Or 8 hour drive from Calais. Well worth it if going on a self-catering basis so you can get all supplies from close by Conthey (30 mins drive). Nice that the village arranged events such as Father Christmas meets kids and gives free presents, free ice skating rink, NY party with live band, fireworks, etc. Mostly Dutch, Swiss and British tourists. 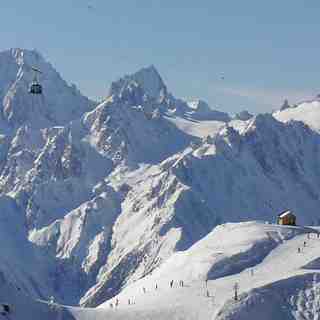 The La Tzoumaz skiing weather widget below is available to embed on external websites free of charge. It provides a daily summary of our La Tzoumaz snow forecast and current weather conditions. Simply go to the feed configuration page and follow the 3 simple steps to grab the custom html code snippet and paste it into your own site. You can choose the snow forecast elevation (summit, mid-mountain or bottom lift) and metric/imperial units for the snow forecast feed to suit your own website…. Click here to get the code.